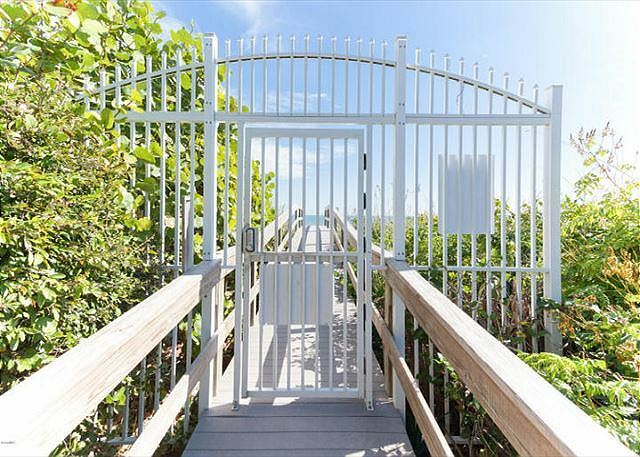 This 4th floor Classic Nautical Oceanfront Condo has 2 bedrooms, 2 bathrooms and sleeps 6. This recent renovation is beautifully soothing in hues of soft yellows, white and blue nautical décor. You will not want to leave! 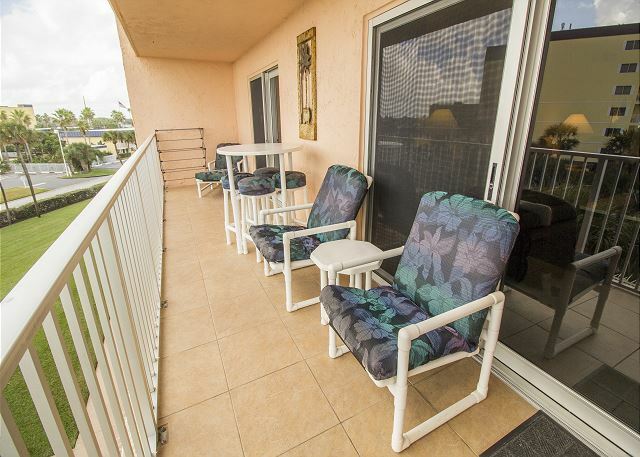 Your living room & bedroom have an extended Balcony that Overlooks the Nostalgic Cocoa Beach Pier to the south. 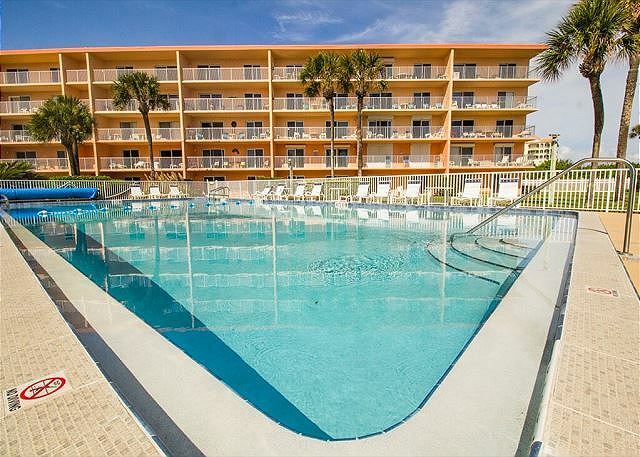 Just below your Balcony is one of the largest pools in Cocoa Beach! The putting green provides hours of fun for the kids while you watch from your balcony with drinks in hand. We have been staying at the Towers for about 10 years.Every year is an enjoyment. We especially enjoy unit 44 and have stayed there several times. It is well appointed with lots of ocean type decorations. This was a month away to celebrate our retirement. The accommodations was wonderful the people we met was friendly and helpful. We cannot wait to do this again. The condo rental was very easy. The location was just as pictured with excellent views of ocean and pier. The condo was well equipped and clean. Overall a fantastic experience. Beautiful location, fantastic accommodations! Top Notch! This condo was everything we wanted and needed! The view is absolutely breathtaking--so, so incredible. The condo was immaculate and accommodated our family of five easily! We all loved the direct access to the beach. It's just a short walk to the pier. There's convenient access to nearby restaurants, and a grocery store is just a couple blocks away. We appreciated the beach supplies. The property management is very strict about the rules, but as a result, it was a very enjoyable stay. We felt very safe. We cannot wait to return back to this rental!Thank you for sharing your home with our family -- we created memories that will last a lifetime! Thanks for being a great guest and the nice review. The owners of this condo had everything possible that you may need. All the was from sippy cups to after sun lotion. No Neto even pack beach towels or chairs because they had those too!! Would highly recommend this place to anyone. Even had food recommendations in the binder for you. Love the condo and location. Thank you for the nice review and we appreciate you as guests. Hope to see you again. Fantastic location! Very nice & well maintained condo building! This is our first year staying in this condo and it definitely won't be out last. 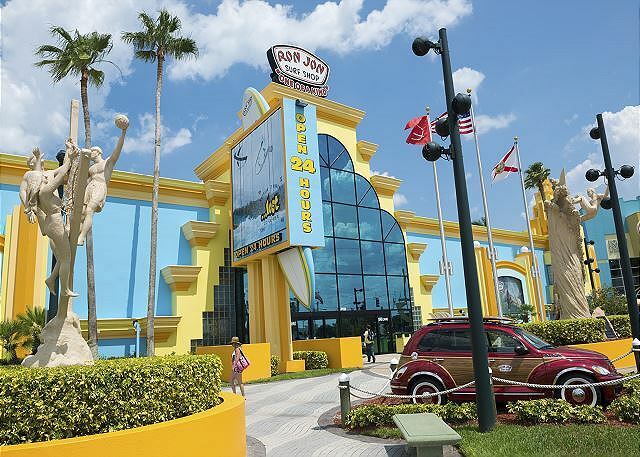 The location is centralized between downtown and Cape Canaveral so there are tons of choices for eating out. Publix is right across the street so you have everything you need within a 5 minute drive. The condo is maintained and is all you need for a week at the beach. The best part is the large patio with seating for 7. You can sit out there and watch the sunrise or walk down to the beach but the view is great from the patio! Thank you for being wonderful guests. CONDO WAS BEAUTIFUL INSIDE AND OUT! Thank you for the review and it is always a pleasure to have you and your family as returning guest every year. Cant wait to have you as guest again and we will give you a special discount next time just to say thank you for your continuing business all of these years. What a wonderful vacation on the beach! The views were stunning, the condo was exceptionally clean and the bedrooms were great for our family of five. Would love to come back! We had a great, six- night stay here. The condo is wonderfully equipped with everything you need to cook, eat, sleep, do laundry, entertain, and enjoy a beachside vacation! The view from the large balcony is marvelous. The complex is very quiet and near to many restaurants and stores (within walking distance). The bathrooms are nicely updated. There are plenty of extra towels & pillows. There are at least six beach chairs, two boogie boards, children’s beach toys & even some handy coolers to use. We would definitely stay here, again, and highly recommend it. And by the way... “Pita Paradise” has amazing Mediterranean food! The condo was beautiful! It was up to date, clean, and well cared for. There were plenty of pool/ beach toys available in the condo, along with a canopy and several beach umbrellas. There was even tennis rackets and golf clubs available in the room for use. The only draw back was there was not a washer and dryer in the condo, but the laundry room was next door. The condo also overlooked the pool and had a great view of the ocean and the pier. I would definitely stay here again. The view from the condo is awesome and the owner of the condo tries to make sure renters have everything that they need. We have notified the owner of the condo about renters request to add a washer and dryer to the unit. Thank you for being our guest. The unit is lovely well furnished and in a great location. We had a lovely vacation in Cocoa Beach. Great location with a picture perfect view. My family and I stayed at the condo in May 2017. It was great. There was plenty of room for the 6 of us. The kids had plenty of room with the king bed and bunk beds in their room and my wife and I had a king sized bed in our room. The condo was well stocked with beach toys and chairs, 3 tvs and everything we needed in the kitchen. The porch overlooked the pool and on to the ocean; it was perfect. On a side note, you're only about an 1 1/4 to 1 1/2 hours from the condo to Disney/Orlando and about 25 minutes to the Space Center. Terrific time at "the Condo". Our kids love it. We are return renters. Thank you for staying with us again and glad your kids had a great time. My wife and I have stayed up and down this beach for many years. We struck gold when we tried this condo in this complex. The view is wonderful, the pool is the best of the hotels and condo complexes in the area. This condo is well cared for and tastefully decorated. 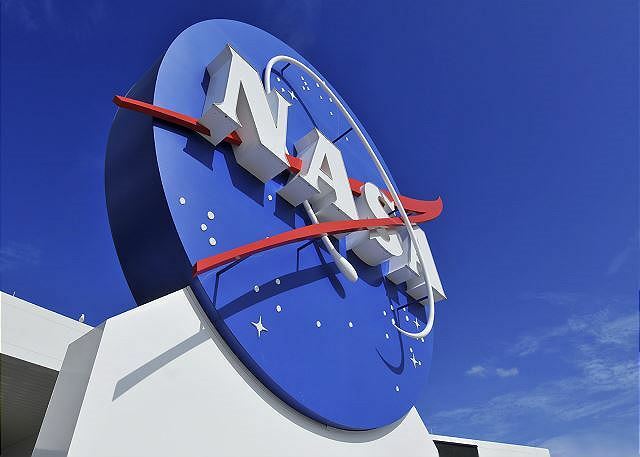 It's an easy drive to and from Orlando and the Kennedy Space Center. Going out to eat or need groceries? They are all close by. The pier is an easy walk on the beach or up the street. We give it two thumbs way up. Me & my wife were very happy with our rental & rental experience. Our condo was very well up kept & very spacious with an incredible view of the beach & ocean from both the master bedroom & living room. The pool was very nice & large and was very near to the beach which made it nice to have just a short walk from the beach. The complex is well taken care of & secured! Great experience & cant wait to go back!! Exactly what the family needed!!!! Cbt44 exceed our expectations everything we need was in this unit. I think that the owners were very thoughtful in how they have prepared this beautiful was our first time visiting Coco beach and because our great stay it want be our last. Thanks for everything!!! We enjoyed the accommodations, cleanliness of the unit the local of the condo,beach access, warm pool "LOL" looking forward in coming back again and try it again. We love to know about any vacation deals or discounts if any. The property was large, comfortable, clean & very well stocked with emergency supplies when arriving late at night (to be replaced) & everything you could possibly need, beach canapy, toys, coolers, chairs, books, towels etc, local information. Good customer service was provided throughout both via email or in person. The balcony & apartment were relaxing in themselves, as well as the beach & pier where the food & drinks were good. We visited some of the theme parks all within just over an hours drive away Space Kennedy, Blizzards Beach, Universa (l of A), Hollywood Studios. To get away from the mayhem we al wanted to see local places & went to the flea market and the Historical Villages of both Cocoa Village & Melbourne Village. Would we recommend to a friend, of course, would we come again most definately, there are more places to see I really didnt want to come home! Stayed for a week in early May. We found this to be a very clean and well presented property, it was perfect for our needs. Location was fantastic with great views of the beach and only a 5 minute walk to the pier for entertainment. We loved going to sleep to the sound of waves on the beach and waking up to the sun on the balcony. This condo is highly recommended by us and we hope to return for 2 weeks next time. We couldn't have stayed at a better place! The view, the beach, the pool and the condo were superb! Everything and anything you could possibly need was right there or within walking distance. We definitely will stay there again! Best view in the best condo on Cocoa Beach! We have been coming to the space coast for many many years and have stayed in many condos and hotels in the area. This Condo is an 11 on a 1-10 scale. Great view of the ocean, Cocoa Beach Pier, surfers and ships coming and going from the Port. A great condo in a treasure of a complex. Building management are friendly and very personable. This one has it all. We had a wonderful stay. The condo was clean and exactly as advertised. First time ever renting a condo and it was more than we expected. Perfect location. Kitchen had everything we needed. Bathrooms were beautiful. In the morning had my coffee on the balcony, at night, my wine. It was the perfect place and location! The location for our daughter's wedding was just down the road . We enjoyed the views and location to the beach, pool and Pier. Everything we needed or wanted to do was close by. I would definitely stay here again! The condo was perfect. There was plenty of room for my family of five. The location was perfect and the access to the beach was great. We were a little disappointed by the strict rules for the balls - kick boards etc...but it didn't stop up from enjoying the beautiful pool. Towels were provided but there were no beach towels for the pool or beach. My only recommendations would be to look into a washer and dryer in the unit (we ended up having loads going on 3 different floors) and the mattress in the master seems a little tired...might want to consider replacing in the near future. In all it was a wonderful-clean unit and we would rent again in a second. Coco Beach Best was great to work with and very accomidating. Great experience! My family and I returned to CBT44 for a second year it a row. What a great week!!!! All the comforts of home with a breathtaking beach view! Our third time staying in this unit. A very relaxing and comfortable unit. The condo was absolute perfection. We felt right at home. Everything we needed for the beach, umbrellas, fold out gazebo, sand toys, and body boards! We were very satisfied with the cleanliness of the condo. The kitchen was fully stocked with pots, pans, coffee maker, blender, it was just perfect for cooking a great meal! The BEST balcony with ocean views in both bedrooms, and the kitchen!!! We will definitely be returning to cocoa beach towers unit 44! I have rented several times at Cocoa Beach and this by far was the best overall unit I have ever rented. 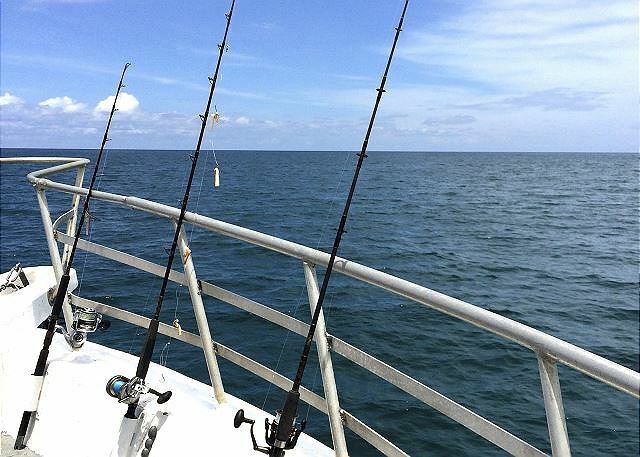 The unit was large, had amazing ocean views and was well equipped in every way. Instructions for all the appliances, TV, internet, etc., were provided and we found the unit extremely clean. Had a wonderful time. Great facility, close to everything. Recommend without hesitation. Already looking forward to next year! This condo was just like the pictures and descriptions made it out to be. Location was great and view was outstanding. My family was very happy with the whole experience and I highly recommend this place for your next vacation. Amazing Stay! Condo better than advertised! Everything about this condo was perfect! The view was spectacular from the deck. The location was great with the beach just steps away. The condo itself was well decorated and immaculate. The grounds were beautiful. 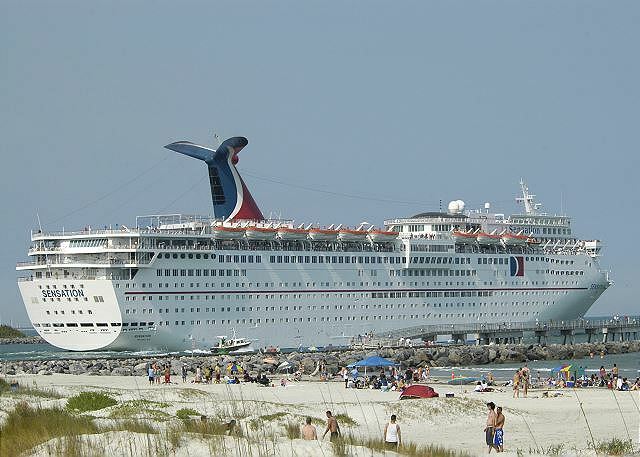 We have rented many places in Florida and along the coast, and this was best yet! Thank you for a great stay! It was our second trip to the same condo in Cocoa Beach. Everything was great! Everything you can need has been thought of. Accommodating on all ends! Literally: we will always remember my birthday week when we stayed at the PERFECT condo # 44 and watched historic Orion's first launch climb majestically for its space mission. We came to Cocoa Beach over Thanksgiving to spend some time with family in the area but have our own place. It was a perfect set up for my husband and I and our college age daughters. Wonderful views from the balcony, great location walking distance to the Pier and the restaurants there. Chose this unit over others because they have lots of balcony furniture - a chaise, high top table and stools and 2 arm chairs - most places only had a couple chairs. Also, this unit has a table for 6 and comfortable seating for 6 in the family room. We invited my parents over for the day and had plenty of room for dinner and to all enjoy the balcony. Furnishings were nice and updated. Kitchen is well stocked and very nice. I made pies and side dishes for Thanksgiving and had everything I needed. Having an assigned covered parking spot was nice as well. We had a maintenance issue while there and the owner's son/manager took care of it promptly. We would stay here again in a heartbeat. The condo was very nicely remodeled and a great value. My semi-retired parents and I were looking for a relaxing getaway and we found that in Cocoa beach! We chose this unit out of several listed on the Internet. We were very very pleased!!! The unit was very clean and we'll maintained. It was just like the pictures indicated it would be. We enjoyed the pool very much. The water was crystal clear and the pool was clean. The entire property was very clean. We loved our stay and definitely will be returning! Condo was awesome! Managing company helped with the arrangements and time schedule to fit our needs. I would recommend this place for fun and relaxation. Condo was clean and well equipped. This Condo was comfortable...linens,towels and beach equipment was plentiful and very nice. The utensils are a little light in the Kitchen. We had a great stay and were very comfortable here. The view, pool and beach are terrific. 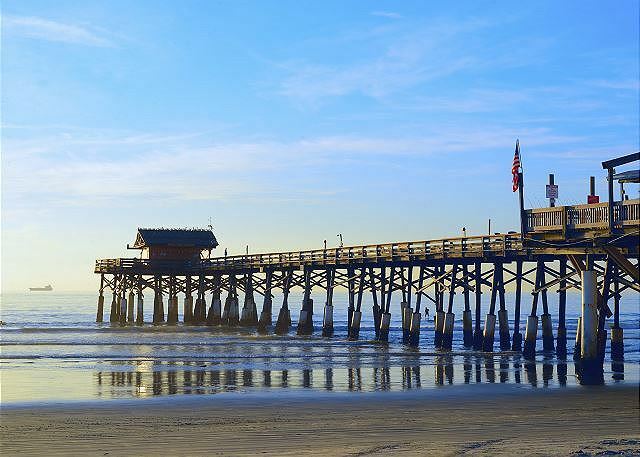 Come and experience the beauty of Cocoa Beach. We had a great week condo was wonderful would come and stay again. 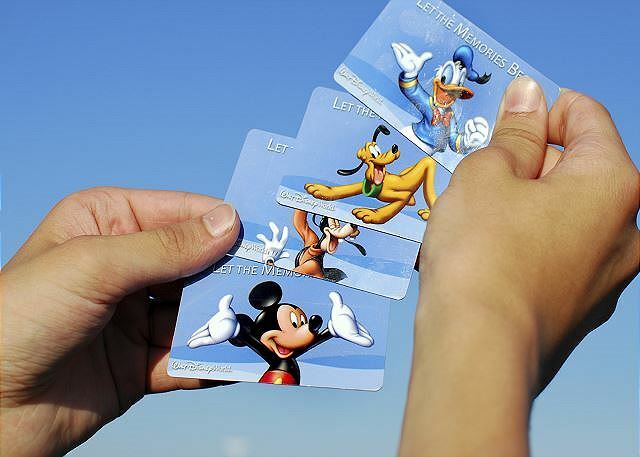 This is the perfect family spot if you want to combine a Disney experience with the beach. Unit is very well furnished and very clean. We will be back! Another great vacation experience at CBT #44. The property was immaculate, the view from the balcony of the ocean and pier was fantastic, and the staff of Cocoa Beach Best was absolutely the best! We can't wait to return next summer! The condo was excellent. I loved the view, the box of beach toys for the kids, the pool, and the cleanliness. We had a great stay! Cocoa Beach Best, Inc (Marla) was great helping us get booked. The management at the condo was so nice and friendly. This condo is more than comfortable for 6 people. It was immaculately clean, spacious, full kitchen, beach "stuff," close to the Pier and Ron Jon's. If we are back in Cocoa Beach, I would definitely stay again! IT WAS TRULY AMAZING!!!!!! DEFINITELY GOING TO BOOK AGAIN!!!!!! We loved the rental property and are looking forward to reserving it again next year too. We appreciate the owners giving up a week of their winter stay to allow us to rent it from them. We had a little issue with the AC at first, but the rental company was very professional, empathetic and responsive and we will always continue to bring our business through them. Especially for this property! What an amazing time we had and the other residents are always so pleasant. Unbelievable location, view and beautifully decorated interior. Thank you again for a wonderful, heavenly vacation at this location. Great place to stay on Cocoa Beach!! The owners of his condo thought of everything that you would need to enjoy yourself on the beach. The location was great and the condo was very clean. Would definitely stay here again!! The condo was great! Very clean! Several beach chairs and lots of beach toy available to use. The washer and dryer were very close to the unit. Very spacious. Would rent again. Our family of four recently stayed here and had a wonderful time. The property was just as it appeared in photos - maybe better. It is close to the pier, which is nothing all that exciting, but no noise or problems from being close. We had a nice view of both pool and ocean. The condo was extremely clean - and i am very picky. 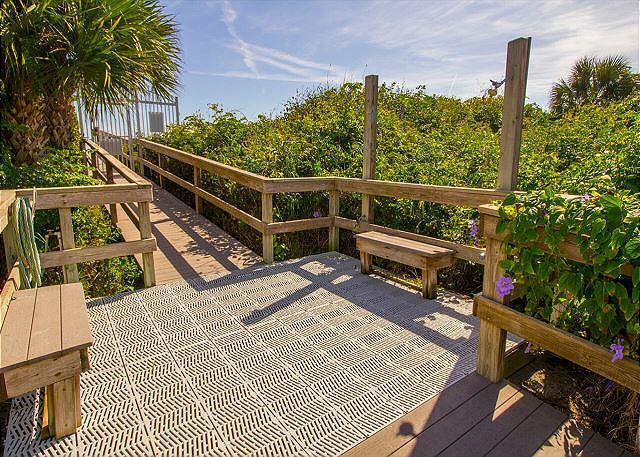 The elevators were easy to get, and the location is in a great area of Cocoa Beach. Beds were soft and comfortable, and plenty of dishes, pots, pans etc. There were four beach chairs, which was very helpful, and pool toys for younger children. Our only complaint was having to launder towels before check-out, which was difficult because there was only one dryer working, and the condo does not have its own washer/dryer. They were kind enough to extend our checkout since there was no one coming in, but we had to get to the airport and had to wait on towels to finish drying. Overall, we had an excellent stay and would highly recommend to anyone who wants a relaxing stay in the area. Beachy decor, every dish, pot and pan you'd need, hairdryers in the bathrooms, an electric grill on the large balcony, comfortable beds and furniture, flat screen TVs with cable, walking distance to the store, and the list goes on. The owners of this unit obviously care about the property and their guests! Our family had a spectacular time enjoying the condo and the beach. We can't wait to go back. We wanted to go to Universal Studios for a few days and this was the closest beach. While we usually got to the Gulf because its closer, we decided on Cocoa Beach and was pleasantly surprised! The condo was perfect: clean,comfortable & beautiful! Property management was wonderful. They were very professional and accommodating with our late reservations and arrival. The condo was spacious and our family had no trouble settling in. Breakfast on the balcony was most relaxing, the views were spectacular! We will certainly return.